So, my friend, you are here at last. After untold dusty decades of silence and despair, you have arrived. You enter my family home, my private rooms, and sit at my writing desk, sniffing the air, perceiving the faint aroma of the pipe tobacco in which I once indulged while composing correspondence or writing my journal. You sit back in my now threadbare tulip-wood chair that has been eaten by worms and gnawed by rats, and try to imagine what it was like in former days. From the fractured remains of the large oak secrétaire à abattant, the surface of which was long ago shone to a gloss by the cotton cloth of my sleeves, you let your eyes roam across the broad expanse of lush green parkland, from the upright poplars bordering the lane, across to the ruins of the little chapel and its overgrown, crowded graveyard, and then to the rambling outhouses and empty stables, linked to the chateau by balustrades that enclose the ancient courtyard. The park is usually shrouded in drifting mists, but on a clear day you can see as far as the river and the village beyond. You could be anywhere in France. But you are here with me and I need you to do something for me. You see, I have a story to tell and you have time on your hands. I know you are aware of my presence. I am standing close behind you; the hairs on the back of your neck rise and bristle, and there are the tiniest goose bumps on your arms. Your scalp creeps, your heart races and your tongue feels like a shrivelled leaf. Why don’t you react, turn around, or utter a sound? What I feel now is very similar to the sensation you experience: when you feel my breath on your cheek, when the heavy salon door creaks open or the ancient floorboards squeak. That tiny breeze you think is coming from the window is the same tiny breeze that I first felt when you arrived here: the one that links us, the one that makes you shiver. I savour that thrill, the knowledge that I have you at my disposal and that we have connected across history and time. So, now that we have become properly acquainted, I think that you, my friend, are ready to experience the story of my ancestral home, exactly as it happened, but in reverse order. I have granted you the honour of performing the role of ghost writer. If you look in the top left-hand drawer of my bureau, at the very back you should still find my quill pen which, for you, is a primitive but authentic writing implement, and a personal link to me. You will also find an antique bottle of ink. Everything is as it should be – you already have several blank sheets of writing paper. You are prepared for a journey to the past. Listen to the scratch of the quill as you record my recollections on the paper. It reminds me of the clawing and gnawing of the rats who have assumed possession of my chateau. Indeed, they are the guardians of the gate: they prevent almost all human infringement of its perfect solitude and, at the same time, offer me some company and amusement. You, on the other hand, are merely a channel for my past ordeals – a spiritual secretary of sorts. Later in the present day and farther back in time, it is dark, but not yet night, when you are disturbed by the echo of booted feet crunching up the path. These intrusions are not quite as frequent as they seem, but each one leaves its mark on the essence of the place. Once again you identify soldiers, this time in a different uniform. They too speak another language, which you recognise as English. You can hear shouts and expletives from different parts of the building as they force open doors that have been locked for years, swarm down the dank cellar steps and stumble back up again. It takes some time before there is a yell of discovery from the upper floors and a scrawny young man of about eighteen years, filthy and partially dressed in a similar uniform, is hauled down the wooden steps from the attic and the once ornate marble staircase, which is now caked with dust and rubble, to the entrance hall. He knows only too well what will happen to him: he will be taken from this sanctuary to a place of execution, for desertion in time of war. He pleads with his brothers-in-arms for mercy; tells them he is suffering from dysentery and needs medical help. Where are the bodies and souls of all the young deserters who too have known exactly what would be waiting for them? Once again you are compelled to watch as he is marched off, up the path and into the main courtyard. On this occasion, just one shot pierces the gloom. The gloom has now infiltrated the sanctity of the room so that you no longer feel alone; there is only a spluttering candle to disperse the throng of spectral shadows. The scratching of the pen is syncopated by the tapping of a branch on the window pane and the patter of mice in the wainscot. Your empty stomach rumbles to remind you of your bodily needs, which can not be met as long as you are fulfilling my spiritual requirements. You are compelled to scribe; to take my place as the teller of the tale. My memories have become your ordeal, which you must endure. Night marches relentlessly on, time regresses. You had forgotten how peaceful a place the chateau can be. You can barely recall how sumptuous this room was, with its walls covered in silken tapestry and its lacquered furniture. Most of the loyal servants who attended to your every whim are long gone, together with the coachmen, stable lads and even the horses. Your reverie is disturbed by the distant rumble of large wagon wheels; you hear the thud of many feet on the path, running round the outside wall, looking for ingress into your refuge. They must be strangers to the house. You know what it is that has brought them here in the middle of the night, at a time when most God-fearing men and women are safely tucked up in bed. But you are no longer God-fearing. You fear something more tangible and mortal, which is heralded by the flare and flicker of wooden torches, soaked in pitch and lit from a nearby beacon. Breathe in the blend of acrid smoke and fear that climbs like tendrils of ivy up the walls and through the cracks in the windows. It is not your terror, but that of the uninvited callers, a terror they wear with pride like a badge of honour, or bear like an invisible pennant. And this time you know it is you that they want. A persistent pounding echoes through the house, followed by the splintering of the great wooden door and the crash as it hits the flagstones. The stomping of peasant boots and the harsh rustic tones of the local sans-culottes fracture the peace of the salon as they infiltrate your home. You are helpless as calloused fingers grip your arms and drag you out to a waiting cart, a tumbrel, to be trundled through the night, across open country, through rustic villages and communes, without sleep or water, and only a filthy sack to keep out the damp and chilly air. This time when you shiver it is a combination of cold and sheer horror. You know what fate awaits you. 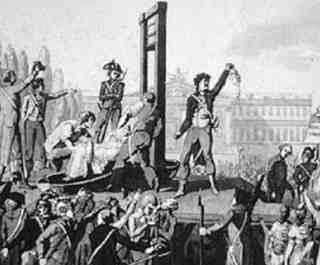 It is just after break of day when your ropes are tightened; you are blindfolded and led up the rickety steps to the woman France most fears: Madame la Guillotine, monument to the revolution. You can smell the fetid straw, soaked with blood, urine and faeces. You can hear the baying crowd and the whimpering of a small group of citizens awaiting their final call. But you can only picture in your mind the rough baskets containing freshly detached heads. You are placed on the splintered bascule; your head forced down so that your neck is held firmly in place by the wooden upright of the lunette; and in less than half a second, the time it takes for the blade to fall, a thought crosses your mind: who will release your beloved wife, four infants, and your remaining faithful retainers from their hiding places in the cellar and the attic of your chateau? That thought stays with you for thirteen seconds after your head has landed in the basket. It is only now that you wipe the quill on a handkerchief you keep in your jacket pocket and dare to look up. In the murky blackness of the window you expect to see your own familiar reflection. In its place, however, you see a grey, festering visage, its watery eyes staring back at you, the powdered wig askew (only the best, made from human hair), the neck ragged and caked with dried blood, the shrivelled lips pulled back over black uneven teeth. You blink, as if to banish the phantom, but the vision remains. Yes, it is I and, if you focus on the gathering shadows behind me, you will make out others who have sought refuge here. My breath fell, paused, rose and shook with the words. You managed to keep me captivated till the very end. Hats off! I’m delighted it had that effect on you. I wrote this after dreaming about it and got up in the early hours of the morning to write it down as quickly as possible. When I came to the final line, the hairs were standing up on my forearms! I have polished it up quite a bit since then.